Chinto kata has a fascinating history and it is necessary to have some understanding of that history if we are to understand the kata itself. The creator of the kata was Sokon “Bushi” Matsumura (1809—1902) who played a huge role in the development of karate and who was also the chief bodyguard to three Okinawan kings. Matsumura is believed to have studied under Tode Sakugawa, Iwah, Ason, Kushanku and, crucially for the purposes of this article, he also studied under a shipwrecked Chinese martial artist who went by the name Chinto. Chinto became shipwrecked on Okinawa during the 1800s and, in need of shelter, he set up home in a cave. Finding himself stranded without resources, Chinto began to steal food and livestock from the locals at night in order to sustain himself. This unwelcome behaviour was reported to the Okinawan king who sent Matsumura to deal with the situation. As you would expect from someone holding the position of bodyguard to the king, Matsumura was a very skilled fighter who normally defeated his enemies with ease. However, when Matsumura confronted Chinto he found the stranded sailor to be a very skilled fighter and the battle quickly reached a stalemate. Always keen to further enhance his formidable skills, Matsumura made a deal with Chinto: Matsumura offered to provide for Chinto and to help him return to China in exchange for instruction in Chinto’s fighting method. This is how Matsumura began his study under Chinto. Upon Chinto’s return to China, Matsumura formulated a kata – named after the originator of the methods it contained – to ensure Chinto’s methods were recorded and passed on to future generations. Many years later when karate made its way to mainland Japan, Gichin Funakoshi changed the name of the kata to Gankaku (“Crane on a Rock” in reference to the crane stances found within the form) in order to give the kata a Japanese name. Funakoshi did this with all the kata to make karate more accessible to the Japanese. It is by this name that the kata is known in Shotokan today; with the other styles sticking with the original name of Chinto. From this little bit of history we know that the kata is a record of the methods that the great warrior Matsumura learnt from Chinto. We also know Matsumura was interested in these methods because he thought them effective and because he had not seen them before. Essentially the kata is a record of the “unusual” methods in Chinto’s armoury. The kata’s bunkai (application) is therefore highly unlikely to be basic in nature. My study of bunkai shows that many kata start by showing basic skills and as the kata progresses so does the technical level of the skills shown. However, this is not the case with Chinto as it shows fairly advanced methods straight from the start. This is almost certainly due to the nature of its creation. I like to think that at their first training session as teacher and pupil these former combatants broke down their fight as Matsumura learnt about the methods that had been applied upon him. Perhaps Matsumura had hooked his hand around Chinto’s neck during the fight only to have it wrenched off and then be punched for his trouble? That’s certainly what the first part of the kata shows, so perhaps that was the first lesson Chinto gave Matsumura all those years ago? Figure 1 shows the initial move of the kata which hyper-extends the enemy’s elbow. Figure 2 shows the second move of the kata which positions enemy for the following two punches. Maybe Chinto then also showed how he could have thrown Matsumura from the same position? Following the initial stripping of the grip – as an alternative to locking and punching – the kata instructs us to move our rear foot in while pulling the enemy towards us as is shown in Figure 3. The kata then instructs us to turn and pull around (the whole motion often labelled as a “turning gedan barai”). As shown in Figure 4 this will pull the enemy over the hips and on to the floor. This is not a simple technique and yet it is found towards the start of the kata which would again emphasise Chinto kata’s advanced nature. Those who study bunkai on a regular basis will note that many of the techniques found in Chinto, including the two just discussed, are also found in Pinan Godan kata. The Pinan series of kata were created by Anko Itosu – who was a student of Sokon Matsumura’s – in order to be a summary of all the key methods practised in Shuri-te (the karate practised in the Shuri region of Okinawa at that time). Within the Pinan series we can see techniques and drills drawn from older kata including Bassai, Kushanku (Kanku-Dai) and Chinto. It is no coincidence that the techniques drawn from Chinto are all found in the most advanced form in the Pinan series. The most basic bunkai is found within Pinan Shodan (Heian Nidan) with each of the kata building on the last such that the Pinan series presents a structured training program in old style karate. The fact that the Chinto elements are found late in the fighting system that is the Pinan series again reflects the fact that Chinto is a record of the things the experienced warrior Matumura had not came across prior to his fight with Chinto. There are no “basics” to be found in Chinto kata. Indeed many of the drills within the form are longer and more intricate than are found elsewhere (see my DVD Bunkai-Jutsu Volume 5: Chinto / Gankaku). It would be difficult to describe these drills in detail in an article such as this, but I would like to briefly look at part of one of these drill in order to illustrate how the kata have changed over the years and how we need to be aware of those changes in order to make sense of the lessons contained within the kata. Following the throw shown in Figure 4, the kata performs a jodan juki-uke (upper level cross receipt). This is a response to the enemy seizing your wrist in order to neutralise an attempted eye-gouge. 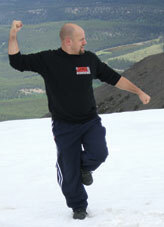 Push the enemy away as you cross your arms and assume the position shown by the kata. Your free arm goes under your seized wrist and over your enemy’s wrist as is shown in Figure 5. By following the kata and pulling the arms in towards your centre the grip will either be stripped, or, if the enemy maintains their grip (which should be pretty strong considering you’ve just attacked their eyes with that limb) the wrist will become locked and they will bend at the waist as shown in Figure 6. In most modern versions on the kata this motion is followed by a leaping double level kick (Nidan Geri), but this would not fit the position of the enemy. 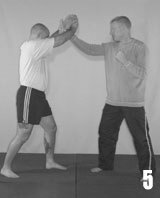 I maintain that the Nidan Geri is a modern “exaggeration” and that the kata originally instructed the practitioner to forcefully kick the lead leg twice in order to break balance and bring the head even further forward for the following techniques. There is strong evidence that Nidan Geri was never in the kata originally. This evidence comes from a tale told by Gichin Funakoshi (who studied under Matsumura and his students Azato and Itosu). In his book Karate-Do: My way of Life, Funakoshi tells us that as well as being the chief bodyguard to the Okinawan king, Matsumura also taught the king martial arts. One day during a training session, the King and Matsumura were sparring and the king attempted a Nidan Geri. Matsumura felt that the king needed reminding that combat was a matter of life and death and hence there was no place for such flamboyant methods. Especially when facing someone as skilled as Matsumura. He therefore countered the leaping kick and ultimately sent a badly bruised king skidding across the floor of the dojo. A now very unhappy king sacked Matsumura on the spot! Funakoshi goes on to tell how Matsumura got into a fight with a local engraver as a result and won through intimidation alone (being the main point Funakoshi wished to communicate by telling the story). He also tells us that Matsumura was ultimately reinstated. The key lesson for me, in relation to Chinto kata, is the obvious contempt with which Matsumura regarded Nidan Geri! He is therefore highly unlikely to have put such a technique in the kata he created – even if it has been part of Chinto’s teaching, which I doubt it was – and hence we can be sure Nidan Geri is a modern test of athleticism as opposed to the original combative method; which will almost certainly have been the two low kicks described earlier. Although the kata gives us a record of Chinto’s teachings to Matsumura, we must keep in mind that it is an imperfect record. In particular, students of bunkai must be sure to filter out what is for show and for athletic development; which is a pretty easy task if we understand the historical development of kata. Following on from the two kicks to the shin, the kata then shows how to apply a strangle from that position. Should the strangle fail, the kata shows how to throw the enemy from a neck crank. Should the crank / throw fail, the kata shows how to re-secure an alternative strangle. And if that should fail, the kata shows how to keep control of the enemy such that strikes can be delivered to the neck and base of the skull. This long flow is typical of the methods found within Chinto kata. 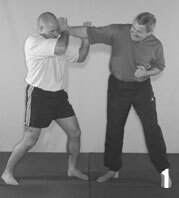 They are methods that should be studied after one has a solid grasp of the combative basics. They represent skilled alternatives that could be used if the enemy is managing to neutralise the more direct methods shown by the other kata. It is therefore right that these methods are taught late on in a student’s martial education; as the kata Chinto frequently is to this day. I hope that this article has helped to convey a little about the history, nature and application of Chinto kata. I also hope it has encouraged you to explore the lessons of this intriguing kata in greater depth. Through Chinto kata we have a living link to the fascinating teachings of a bygone age.